Over the last two decades, intensive field building has supported the emergence of a wealth of civil society initiatives seeking to advance transparency and accountability in public finance at the local, national, and international level. Yet despite this progress, there is a growing sense among practitioners and experts in the field that transparency interventions have not sufficiently translated into accountability gains, or influenced public finance processes in ways that improve people’s lives. The Fiscal Futures planning workshops, convened by the International Budget Partnership, the Transparency and Accountability Initiative, and the Carnegie Endowment for International Peace in the spring of 2018, brought together 35 key actors from 14 countries to take stock of the fiscal transparency and accountability field and to engage in scenario planning to shape ideas for future work. 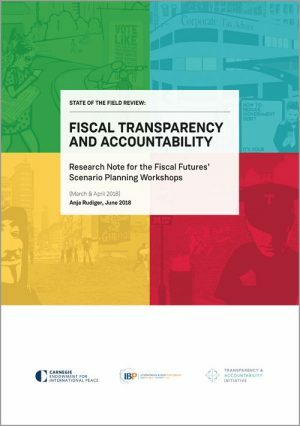 This paper presents an analysis of lessons learned and key questions about future work that we hope will assist fiscal transparency and accountability actors in the field, particularly civil society, in thinking critically about future strategies for transforming public finance in ways that improve the lives of poor and marginalized communities.